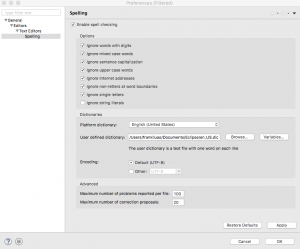 Adding user defined dictionary to Eclipse to add new words to spelling check | Ao's labs of everything! 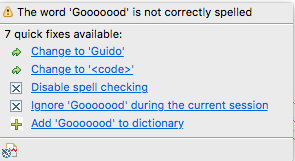 After installation of Eclipse, Eclipse automatically starts to check spellings for you. It uses its default dictionary file and you may find many words that you use on your daily basis do not exist (yet) in the default dictionary. How to add them? Unzip the package after downloading. Copy the “en_US.dic” file to some folder (one that you keep Eclipse library files, for example. One that you don’t delete easily).